The Query Optimizer uses for the Cardinality Estimation the so-called Statistic objects. Every time when you create an Index, SQL Server also creates an underlying Statistic object. That object describes the data distribution of that index. In addition, SQL Server is also able to create statistic objects during query execution, when necessary (Auto Create Stats). The data distribution itself (of the first column in a composite index key) is described in a so-called Histogram. One of the main pains of the Histogram is it can only have up to 200 so-called Steps. A step describes the data distribution for a given part of your column data. The larger your table gets, the more inaccurate your histogram will be, because you can only have up to 200 steps (a histogram must be as compact as possible, it must fit onto one page of 8kb). 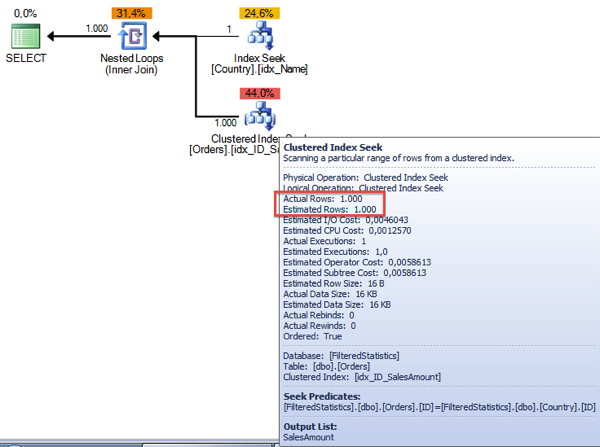 For additional columns in a composite index key, SQL Server stores in the statistics object a so-called Density Vector that describes how unique the values of the composite index keys are (in combination to each other). When you have – for example – 3 different values in a column, the density vector of that column is 0.33333 (1 divided by 3). The query itself must be also compiled (hence the query hint RECOMPILE, if an Execution Plan is already cached), so that you can see in the messages window of SQL Server Management Studio the Statistics that were used for the Cardinality Estimation. Based on this simple introduction to Filtered Statistics, I want to show you now a real world example how Filtered Statistics can improve the quality of the Execution Plan. In the first step we are creating 2 tables: Country and Orders. The Country table is a simple lookup table, where I have stored all the countries where I’m doing business. And the Orders table just tracks every order, and has a relationship to the Country table so that I know in which country that order was placed. In a Data Warehouse scenario you can also think about a fact and dimension table. 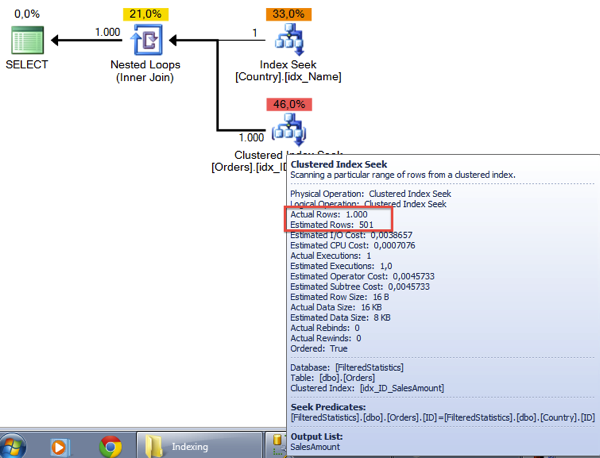 SQL Server estimates 501 rows, and in reality the Clustered Index Seek operator returns 1000 rows. SQL Server uses here the Density Vector of the Statistics Object idx_ID_SalesAmount to make that estimation: the Density Vector is 0.5 (we have only 2 distinct values in that column), and therefore the estimation is 501 (1001 * 0.5). When you have created Filtered Statistics on your tables, you also have to be aware about the maintenance. The automatic maintenance is again done by SQL Server when 20% of the underlying data has changed – from the *whole* table itself!!! Imagine you have a table with 10000 rows, and you have created a Filtered Statistics object on a subset of that table, let’s say 500 records. In that case, SQL Server will update the Filtered Statistics object when around 2000 data changes where done for the given columns. So you have to change 4x the data in the Filtered Statistics objects, until SQL Server will invalidate and update it (when you have no data changes outside the Filtered Statistics interval). So this is a big bummer, that you have to have in your mind, when you are working with Filtered Statistics. I hope that this blog posting gave you a good overview about Filtered Statistics, and how you can use them in SQL Server to improve the Cardinality Estimation for given queries.